We hopped into our little Alpha Romeo rental car Wednesday morning and set off on our first road trip in Tuscany. 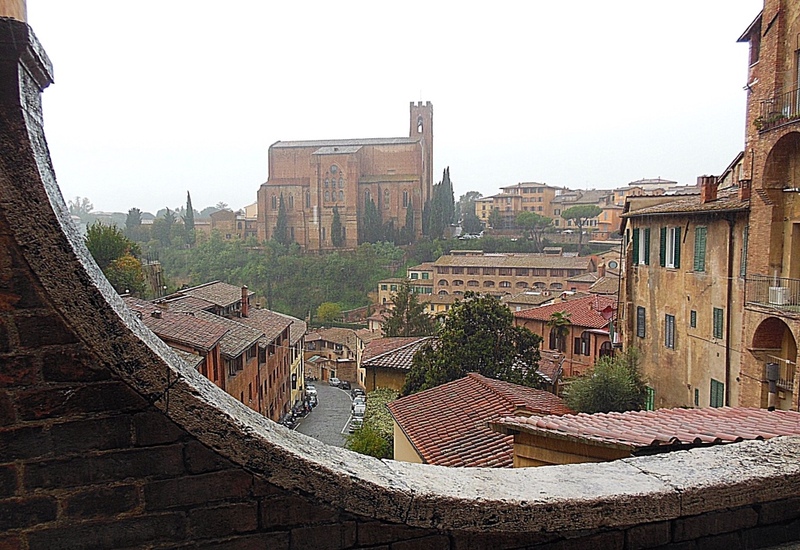 We refused to let overcast skies dampen our spirits…it was not yet raining and maybe we could take in the sights of Siena before the promised rain began to fall. With some advice from our host, who pointed us in the right direction, we set off with a map, high hopes and a full tank of gas! After a short walk, the buildings of the city come into view. Two minor wrong turns and 90 minutes later we managed to find our way to the IL Campo parking lot; exactly where we wanted to be! We pulled in just as the skies opened up. With a stop along the way to purchase an 8 Euro umbrella, we quickly walked thru the 12th century Piazza del Campo. On a nicer day, we might have lingered, but today we find it filled with too many tourists and tour groups all looking for a warm dry spot to eat. Even in the rain, the views are breathtaking. After lunch at a quiet place in the much smaller and less touristy Piazza Indipendenza, we headed to Siena Duomo, described in our guide book as “one of the most spectacular in Italy.” After today, I think we would have to agree. 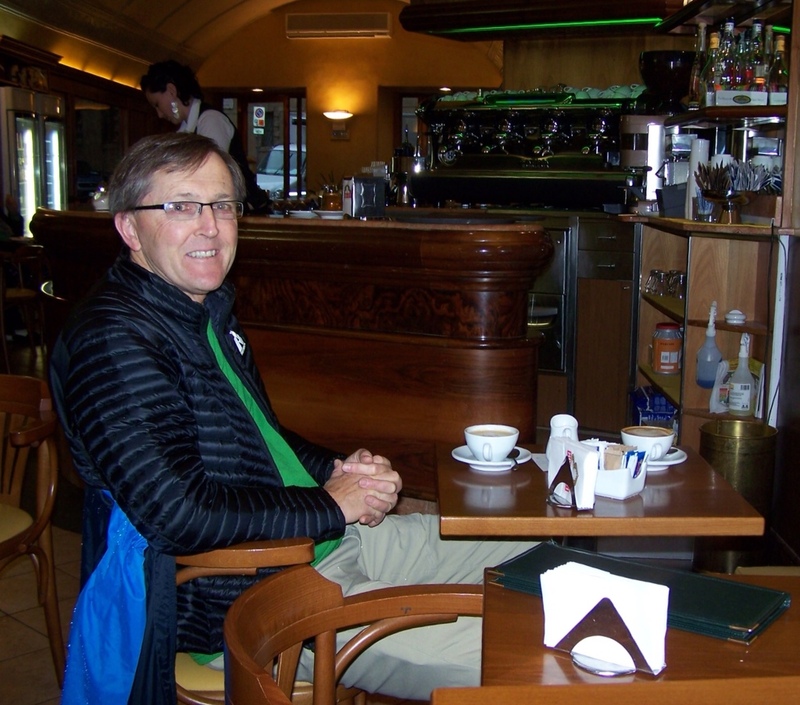 Not every place offers it, but Reg was able to order a decaf Americano at this Siena cafe. We have grown to love the coffee bars in Italy. While many sit and enjoy conversation or a newspaper with their cappucchino, others stand at the bar only long enough to down a quick shot of espresso. If you blink, you'll miss them! Loverly! 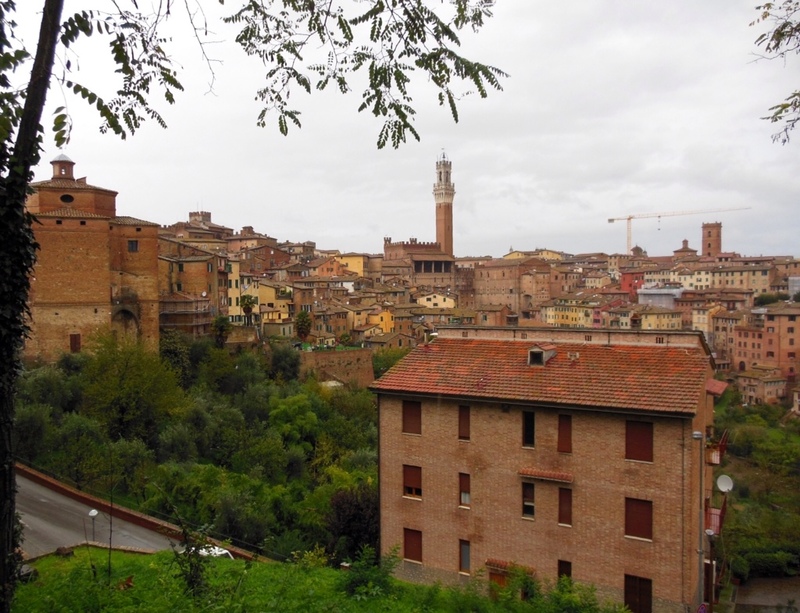 We spent a month in Montepulciano. Your pictures all tell the story. Great photojournalism! How was the Italian decafe? Thank you, Carolyn. The decaf was excellent…all the coffee here has been good. They mainly serve shots of espresso and cappuccinos, but some offer Americanos. I need a bit more time here to go Italian…perhaps a year or two!? My Italian is getting so good that the locals are quickly switching to English when talking to me. My ties have retired.